We're about to enjoy a classic game between the St. Louis Cardinals and the Chicago Cubs at Busch Stadium on September 8, 1998. This happens to be the game that Mark McGwire hit his 62nd home run, breaking Roger Maris' 1961 single season home run record. The game was broadcast on the Fox television network. Before the game starts, there are a few things we need. First, you'll need a scorecard, which you can download from my scorecards page. I recommend you use a scorecard that allows you to track runners around the bases, as well as balls and strikes (all of mine have places for this information on them). Second, you'll need a pencil. You could complete the scorecard in ink, but I find that I sometimes second-guess my original scoring and need to erase my first instinct. Once you start scoring games you'll discover there are many intricacies to every play, and there are often multiple possible interpretations of the events in the game. Finally, it's handy to have a copy of the rules close by. During the half inning breaks, you can look up the rules for particular events that you may never have seen, or thought about before you had to write them down. Usually this isn't necessary unless you are being particular about the statistics you will generate (like whether a run was earned or not), but it sometimes helps. I encourage you to write everything down on your scoresheet, even if it seems like you could easily just follow along using the pictures and descriptions on this page. Most of the images I put on these pages are just very small subsets of the entire scoresheet, and it will be difficult to follow the players and action without having a scoresheet with the action so far on it. Plus, reading and writing at the same time works more than one part of your brain and reinforces the information. Believe me, scoring requires a lot of concentration and quick thinking when a game is going on, and there is no announcer to tell you what just happened. You'll be glad you went through the motions here. Now that we've got all this, it's time to fill out the initial information on the scorecard. First we need to complete the heading information on each side of the scorecard. On one side of the card (the visitor's side, or the side for the Cubs) you write the team that whose offensive efforts will be recorded, as well as where the game is being played. I normally also write the date on the sideline, as well as other extraneous information such as the weather, the time of the first pitch, and the home plate umpire (for this game, the home plate umpire was Steve Rippley). Occasionally I'll add a little picture of the ballpark with the outfield fence distances. See the picture on the right for a sample. In many of the pictures, the scorecard is cyan and the writing is either black or red. In this Guide, I will write all information for the current batter in red, and everything else will be in black or grey. This way you can tell the difference between what I wrote during a particular players at-bat, and what came before. I will also write the scorecard notations in a different font to distinguish what you write on the card, from the text of the tutorial. After this information is recorded on the visitor side (Chicago Cubs at Busch Stadium), flip the card over and record the home team (St. Louis Cardinals at Busch Stadium). Now we're ready for the starting lineups. A small section of the Cubs lineup appears on the right. Each spot in the batting order has three lighter lines that allow us to insert three players into that position in the lineup. For each player, we can record their number (unnecessary, but sometimes helpful if you are watching live and don't know the players very well), their name, the position they play in the field, and the inning in which they entered the game. I often add extra information for the players I've entered such as their batting average at this point in the season, and whether they bat left or right handed. If a player is on a streak, or is close to beating a record, I sometimes put that in the player name section as well. The image on the left shows the position numbers for defensive players. In American League games, I usually use 0 for the designated hitter, but 'DH' will also work. It is often difficult to write down all of this information as the announcer is quickly reading off the names and positions of the players. I have found that if you are running out of time, it is better to indicate the position numbers for each place in the lineup than it is to record the name of the player. This is because you will have plenty of time to write down their name as they come up to bat, but if you don't necessarily recognize them in the field, you won't be able to figure out what position they play as they come up to the plate. Good announcers will tell you the name, position and relevant statistics for each player as they come up to bat, but not all announcers will. For this game, and most games that I watch on TV or listen to on the radio, I simply go to ESPN's major league baseball site a few minutes before the game, and get the lineup from there. 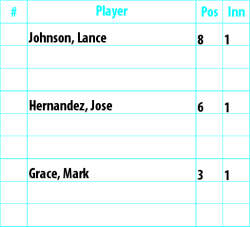 For the Chicago Cubs, the lineup is as follows: leading off and playing center field (position 8) is Lance Johnson. Next up is the shortstop (position 6) Jose Hernandez. In the third spot for the Cubs is Mark Grace, who plays first base (position 3). In the cleanup spot with 58 home runs on the season, is the right fielder (position 9) Sammy Sosa. The fifth spot is taken by left fielder (position 7) Glenallen Hill. Next is the third baseman (position 5) Gary Gaetti. The seventh position in the lineup is Mickey Morandini, the Cubs second baseman (position 4). Next is the catcher (position 2) Scott Servais. Finally, at the bottom of the order is right handed pitcher (position 1) Steve Trachsel. On the other side of the scorecard, the batting order for the St. Louis Cardinals is as follows: Delino Deshields (second base - 4), Fernando Tatis (third base - 5), Mark McGwire (first base - 3, 61 home runs! ), Ray Lankford (center field - 8), Ron Gant (left field - 7), John Mabry (right field - 9), Luis Ordaz (shortstop - 6), Kent Mercker (pitcher - 1), Eli Marrero (catcher - 2). Now, what about the pitchers? They go in the section below the lineup, but on the opposite side from their teammates. This is because they are directly involved with the offensive players they are pitching against, and their entry and exit from the game is part of their opponent's batting. So on the Cubs side of the scorecard, you write Cardinal pitcher Kent Mercker's name. As a result, he appears on both sides of the scorecard, as a pitcher on the Cubs side, and as a hitter on the Cardinals side. Notice that you indicate the inning he enters the game. I often include which arm a pitcher uses (LHP or RHP) and relevant statistics. On the St. Louis Cardinals side of the scorecard, you write down the Cubs pitcher Steve Trachsel (RHP). The images in this Guide only show the at-bat boxes for the current action, so you may have trouble visualizing how all these boxes fit together. It's helpful to download the PDF of this game, completely filled out. I encourage you to follow along, and even write out the game on a blank scorecard, but it is helpful to check your progress against a scorecard that's filled out correctly (I hope!). The complete scoring for this game (PDF, 136KB) is available by clicking this link. Now we are finally ready for the action to begin. The way the scorecard works, there are rows for at-bats (or positions in the lineup), and columns for innings. So the first at-bat in this game will be recorded in the square that intersects Lance Johnson's row, and the column labelled 1. When the inning is complete, and the Cubs come up to bat in the second inning, we will move to the column labelled 2, and the row for the next player in the lineup after the player who made the last out. 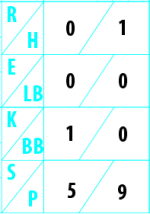 The rows at the bottom of the scorecard (next to the pitchers) are used to keep track of runs scored (R), hits (H), errors made by the team on defense (E), players left on base (LB), strikeouts (K), walks (BB), strikes (S) and pitches (P). Like the pitchers, the errors recorded on one side of the card actually apply to the team on the other side, because defensive errors occur during the at-bats of the other team. The Cardinals are all on the field, Lance Johnson has stepped into the batter's box, and the umpire has indicated he is ready with the word Play! The first pitch from Mercker is a strike. We write a small 1 in one of the two little boxes on the lower right of the at-bat box for Lance Johnson. The two boxes on top represent strikes, and the three below represent balls. Since we will record either a strikeout, or a base on balls, there is no reason to include a box for a third strike or fourth ball. The next pitch is a ball, so we write a 2 in the first of the lower set of three boxes. The third pitch is a second strike, and we indicate this pitch with a 3. At this point it is obvious from looking at the scorecard that there is a 1 - 2 count on Johnson. The fourth pitch from Mercker is fouled out of play. We indicate this by placing a small x or plus (+) to the left of the balls and strikes boxes. 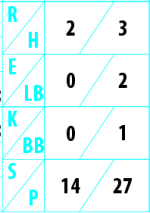 We don't need to use numbers because the numbers in the boxes will tell us which pitches were fouled off. On the fifth pitch of the first at-bat, Johnson hits one to center field, caught by Ray Lankford. To indicate this, we write F8. The F means a fly ball out, and the number 8 indicates it was the center fielder who made the catch. If you flip over your card, you can see that Lankford is in position 8. If you are listening on the radio, you will probably be flipping your card back and forth fairly regularly in the first few innings because the announcers will often simply say the name of the player who made the catch, rather than their position number. To indicate the first out of the inning, we write a 1 in the lower left of the box, and put a circle around it. See the box on the right for the complete at-bat notation. The next batter, Jose Hernandez steps into the box. Mercker seems to lose his control and throws Hernandez four straight balls. We write 1, 2, 3 in the three lower boxes to indicate the three misses. After the fourth ball, we put a circle around the BB on the lower right side of the box. This stands for Base on Balls, and indicates a walk. As we are circling that, Hernandez is slowly trotting to first base. To indicate his progress around the bases, we draw a line from home plate to first base on the little diamond in the middle of the box. I also add a little tail on the line to indicate he stopped at first. As players advance around the bases, we can look at these small tails to see what bases a player actually stopped at. Since the first batter was retired in his at-bat, nothing is written in the box above Hernandez's box. See the image on the left. Keep an eye on the red ink, and whose box it is written in to keep the at-bats straight. Now some interesting stuff starts to happen. Mark Grace steps into the batter's box and Mercker's first pitch is in the dirt and past the catcher. We indicate the ball by putting a 1 in the appropriate box. While the catcher is scrambling for the ball, Jose Hernandez sprints from first to second. Since the ball went past the catcher (either a passed ball or wild pitch) this isn't a stolen base. But he still advanced on the base paths, so we draw another line in Hernandez's box indicating he moved from first to second, putting a little tail at the end. Since the pitch was in the dirt, the play is a wild pitch. To account for the advancement of Hernandez, we write WP above the line from first to second. If it had been a true steal, we would have written SB for stolen base. OK, man on second, one out, count 1 - 0. Mercker seems shaken, but his next pitch is right over the plate for a strike. We write a two in the first strike box. Mercker trades balls and strikes until we reach a full count of 3 and 2. Mercker's sixth pitch to Grace is a mistake and Grace drives it into center field. Hernandez was running on the pitch and as Lankford goes for the well-hit ball, he rounds third and sprints for home. Grace easily makes it to first for an RBI single. Here's how we write all of that action. For Hernandez, he ran from second all the way home, so we draw a line along the base path to home. Since we don't put a tail on Hernandez's run at third base, we can tell that he didn't stop at third, and Grace was responsible for getting Hernandez home. To show the run scored, we put a large dot in the middle of the diamond in Hernandez's at-bat box. This makes it easy for us to see how many runs scored at the end of an inning. In the at-bat box for Mark Grace, we first indicate the single by circling the 1B on the right side of the box. Next we draw a line from home plate to where the ball was picked up by Lankford (in center field). Since Grace made it to first, we draw another line from home, along the base path, to first, and attach a tail to the end of it. Lastly, we need to give Grace credit for an RBI, which we do by putting a dot in the lower left corner of his at-bat box. Again, this is just a way of making it easier to scan for runs batted in. Got all that? The scoring appears on the right hand side of the page. The fourth batter of the inning, Sammy Sosa steps up to the plate. At this point in the season he has hit 58 home runs, three behind McGwire, also playing in this game. The first pitch to Sosa is a ball, so we write a 1 in the first of the three ball boxes. Mercker throws two straight strikes, and then a second ball. Sosa swings at the 2 - 2 pitch and drives it to deep left center field where it falls in for a hit. Not quite a home run, but it keeps the inning alive for the Cubs. As Lankford chases it down, Sosa runs to first and Mark Grace (who was on first) slides into second base. To score this play, we move Grace from first to second by drawing a line along the base path, and add a little tail on the end to indicate he stopped at second. In Sosa's at-bat box, we first draw a line from home plate to deep left center field where Lankford picked it up. Next, we circle the 1B, indicating Sosa's hit. Finally we draw a line from home to first, with a tail. Your scorecard should look like the boxes on the left. Note that I've cut off the first two batters in the inning because they're already in the dugout. So the top box in the figure shows Mark Grace advancing to second, and the bottom box shows Sosa's single. With Grace on second and Sosa on first, Glenallen Hill steps into the batter's box. Mercker's first two pitches to Hill are balls, and Hill is uncharacteristically patient. On the 2 - 0 pitch to Hill, he swings and pokes the ball up the infield to the shortstop Luis Ordaz. Ordaz scoops up the ball and flips it to the second baseman, retiring the advancing Sammy Sosa. Second baseman Deshields rifles the ball to McGwire on first, but not in time to retire Hill. At the same time, Mark Grace is running from second to third where he winds up standing. Here is where scoring can get difficult. Do we credit Hill with a hit since he winds up on first? The key to the play is to examine it from the shortstop's perspective. When he gets the ball all the baserunners (including Hill) are in between bases. He has a very difficult throw to get Grace, an easy flip for Sosa running toward him, and a simple throw to get Hill running toward first. He hopes to get the double play, so he flips to Delino Deshields on second to retire Sosa. A play like this where the fielder can throw more than one player out is called a Fielder's Choice and is not a hit for the batter because he or she could just as easily have been thrown out on the play. In other words, even though the batter reached safely, he didn't hit safely because someone else on the base paths got thrown out. So how do we score this? Let's start with Grace. His scoring is simple -- he ran from second to third, and it was Hill's hit that got him there. We draw a line from second to third and put a tail on the end of the line. In the next box down, Sosa starts running from first to second, but never makes it because Deshields has already tagged the base before Sosa gets there. To indicate this we start drawing a line from first to second, but halfway between the bases, we draw a perpendicular line to indicate he was stopped. Next to this, we write FC 6-4 to indicate Sosa was out on a Fielder's Choice from the shortstop to the second baseman. In Hill's box, we indicate that he made it to first by drawing a line from home to first, with a tail. Since he got there on a Fielder's Choice, we put FC next to this. You'll notice that FC appears in more than one box. All fielder's choice plays should be written in two boxes, with the defensive position numbers added to the box for the player that was thrown out on the play. We don't circle any of the notations on the right of the box because he didn't get on base in any of those ways (i.e. he didn't get a hit, a walk, or get hit by a pitch). This play also represented the second out of the inning, so we draw a 2 in the lower right corner of Hill's box and circle it. Why do we put the out in Hill's box and not Sosa's, since Sammy is the one walking back to the dugout? Actually the out can be put in either box, but since scoring is an attempt to show the action and show the performance of the players, I think it's best to put the out in Hill's box because he's the one responsible for it. The Chicago third baseman Gary Gaetti steps into the batters box with Mark Grace on third and Glenallen Hill on first. The first pitch from Mercker is a strike. Gaetti swings at the second pitch and goes the other way into right field. As John Mabry runs to get it, Mark Grace crosses home plate easily. Gaetti reaches first safely and Glenallen Hill is trucking from first to third. In Gaetti's box (the bottom one on the left), we have already written the first strike. Now we draw a line from home plate to right field where Mabry gets the ball. Gaetti made it safely to first, so we circle the 1B on the right of the box, and draw a line from home to first base with a tail to indicate he stopped there. Finally, we add a dot in the lower left corner of his box to indicate the run he batted in (Mark Grace). The next box up from Gaetti's is Glenallen Hill's box. On the hit from Gaetti, he ran from first to third, so we draw that line on the base path. Finally, the box on the top on the left is Mark Grace's (remember that Sosa was thrown out on the fielder's choice), so we need to indicate he has scored a run. We draw a line from third to home, and put a large dot in the middle of the diamond to visually mark the run that scored. Mark Grace now heads for the dugout. With two runs across already, two outs, Hill on third and Gaetti on first, Mickey Morandini takes his position in the box. After a ball from Mercker, he drives on into left field where it is caught by Ron Gant. This is the final out of the inning. To score this, we will have already written a 1 in the first ball box. The play itself is F7 to indicate a fly ball out, caught by the left fielder. We also write a 3 in the box and circle it for the final out of the inning. Lastly, we draw a diagonal line in the lower right corner of Morandini's box. This is just a visual aid to help lead us into putting the next Cubs batter into the correct column (i.e. when Scott Servais comes up to bat, his at-bat is scored in the second column, diagonally offset from Morandini's). See the image on the right. It is now the middle of the first inning. Kent Mercker got knocked around in the first inning, giving up two runs on three hits and a walk. The complete scoring for the Chicago half of the first inning is shown on the left hand side of the page. It's shrunk down to fit, but even very small, we can still tell what happened in the inning. At a glance it is easy to tell how many runs scored, and by looking at the circles on the right hand side, we can account for the mistakes the pitcher made (walks, hits, etc.). Look carefully at the completed half inning, and see if you can recount the action in your mind. Once again, the order of the at-bats shown on this image is Johnson, Hernandez, Grace, Sosa, Hill, Gaetti, and Morandini. There is one last step before we grab a beer and flip the card over to the home side. We need to tally the simple statistics that appear on the bottom of the scoresheet. Counting up the number of runs scored is easy because we can look at the number of dots in the center of the diamonds. There were 2 runs scored (Jose Hernandez and Mark Grace crossed home plate). By looking at the number of circles on the right side of the boxes, you can see how many hits there were as long as you filter out the walks (BB) and hit by pitches (HP). In this case, Mark Grace, Sammy Sosa, and Gary Gaetti all hit singles. The Cardinals didn't commit any errors in the inning, so write a 0 in the E row. The number left on base when the inning ended was 2 (Glenallen Hill and Gary Gaetti). There were no strikeouts (K) and one walk (BB). For this inning, I counted 14 strikes and a total of 27 pitches. Not an easy inning for Mercker. For the strikes and total pitches, I count up all the called strikes (the numbers in the upper two boxes), add in all the foul balls, add one for each strikeout (since that was the third strike to the batter), and add one for each hit and each out). For example, in Lance Johnson's box we have two strikes, one foul ball and one out for a total of 4 strikes. Add in the number of balls thrown, add one for each walk (the fourth ball to a batter) or hit-by-pitch in the inning and you've got the total pitches thrown. Now we flip over the scorecard and being the bottom half of the first inning. Our scorecard already has the St. Louis lineup listed, and shows Steve Trachsel as the Cubs pitcher. We begin in the upper left box, at the intersection of the column for the first inning, and the row for Delino Deshields. Deshields steps in and swings at the first pitch offered by Trachsel. The ball is a slow dribbler, and before the pitcher can come off the mound, retrieve the ball and throw to first, the speedy Deshields has crossed the bag. An infield single for Deshields! To score it, we draw a line from home plate to the location the ball was recovered by the pitcher to the right of the mount. Next we indicate Deshields' sprint by drawing a line from home plate to first, with a little tail to indicate he stopped at first. Finally, we circle the 1B for his single. Next up is the third baseman Fernando Tatis. Before Trachsel delivers the ball to the plate he zips one to his first baseman, catching Deshields too far away from the bag to get back on it. Deshields is thrown out at first base after the tag is applied by Mark Grace! To indicate this, we draw a short line from first toward second, but terminate the line halfway between the bases with a perpendicular line. The play is listed as PO 1-3 which stands for Picked Off. The pitcher is position 1, and the first baseman is position 3. Finally we put a 1 in Deshields' box and circle it to indicate the first out of the inning. Trachsel then returns to the batter Tatis and throws a strike, a ball and a strike. With the count at 1 - 2 he throws a nasty pitch that Fernando Tatis just watches go by. The umpire calls strike three and Tatis is called out on strikes. At this point we should have a 1 and a 3 in the strike boxes and a 2 in the ball box. To denote the strikeout, we put a backwards K in the middle of Tatis' at-bat box. This indicates he was struck out looking, rather than swinging. A swinging strikeout is a forward K. We also add a 2 to the box and circle it for the second out. With two outs and nobody on base, Mark McGwire walks toward the plate, carrying 61 home runs for the season -- tied with Roger Maris. The crowd rises to it's feet anticipating the record-breaking home run. As Trachsel winds up and delivers the first pitch, the flash bulbs go off throughout the stadium. Ball one. Trachsel throws two more balls, not even close to the strike zone. It's clear that he doesn't want to be the one to give up the 62nd home run of McGwire's historic season. And with two outs and nobody on, who can blame him for pitching away? On the fourth pitch McGwire swings at a lousy pitch well off the plate and grounds one weakly up the middle to the shortstop. Hernandez flips to Grace for the easy out, the third in the inning. To score this, we simply write 6-3 in McGwire's box. Since we already have notations for fly ball outs (F) and fielder's choice outs (FC), an out recorded just by position numbers is a ground ball out. If you wanted to, you could write G 6-3, but it isn't necessary. We also put a 3 with a circle around it in the box. Since it is the final out in the inning, we draw a diagonal line across the lower right corner of McGwire's box. This will lead us to putting the next at bat for the Cardinals (Ray Lankford) into the second inning column. McGwire's ground ball out brings the first inning to a close with the score Cubs 2, Cardinals 0. The image on the left shows the complete scoring for the Cardinals half of the first inning. The image on the right shows the simple statistics for this inning. A tally of Trachsel's pitches shows he threw 5 strikes in 9 pitches, a much better performance than Mercker. Note that the last pitch that McGwire swung at would have been a ball if he'd held back. But because he swung at it, it's effectively a strike for Trachsel. There were no runs, no errors and no one left on base thanks to Trachsel's excellent pick-off move. Deshields is credited with a hit, so we record 1 hit for the Cardinals.